Officers from multiple agencies, including the Oklahoma Highway Patrol, were met with gunfire Friday morning when they tried to serve a warrant in the town of Talihina. 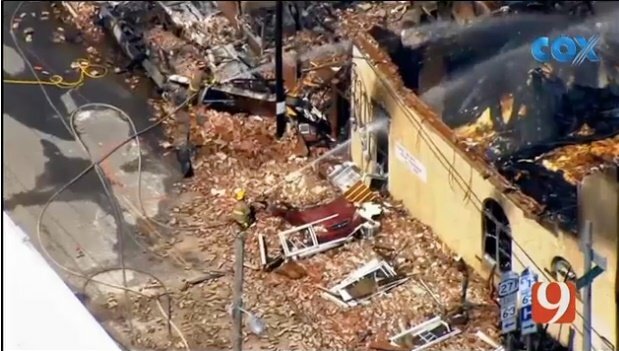 The gunman was killed in the ensuing gunfight and an explosion destroyed his business/residence. Four troopers were injured by gunfire or by shrapnel. A fifth officer was shot and the bullet was stopped by body armor. Law enforcement officials say officers from multiple agencies were involved in serving the warrant for a drug offense due to the man's criminal history and at the request of the Le Flore County Sheriff's Office. Troopers said the building appeared to be wired with explosives and at least one detonated. The building was consumed by the fire. Troopers used a flash bang during the encounter, but they said it did not start the fire. The injured troopers are expected to recover, News9 reports.